Ron Cooper is an experienced and accomplished portrait and travel photographer. Ron invests significant time and effort in getting to know his subjects. His subjects' trust in Ron is readily apparent in his photos. Ron is also superb at immersing himself into the culture of the many areas he visits. This immersion results in moving photos that capture poignant scenes of day-to-day life throughout the world. Ron's photography has been in exhibitions in many venues, has been juried as best in show several times and has been widely published. Ron prints in both black and white and color. 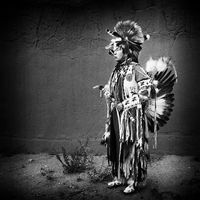 The photographs shown here of selected portraits of Native Americans is a very small sample from one of Ron's many outstanding bodies of photography.